Go to the dark side this Valentine's Day! These dark chocolate Valentine's day truffles have a mocha flavor and a good hit of salt to give them a more grown-up taste than your typical chocolate truffles. You can always reduce or omit the espresso powder if you don't want a strong mocha taste, or if you'll be serving it to children. You can also dip these in chocolate if you want, but I love the simplicity of just rolling them in the colored sprinkles--it's fast and looks beautiful! Place the chopped dark chocolate in a medium bowl. Pour the heavy cream, espresso powder, salt, and corn syrup into a small saucepan and place the pan over medium heat and bring the cream to a simmer. Once small bubbles appear all along the sides of the pan, pour it over the chopped chocolate in the bowl. Let the hot cream soften the chocolate for one minute, then gently whisk them together, until all of the chocolate is melted and your ganache is smooth and shiny. Add the room temperature butter and whisk it into the ganache until incorporated. Press a layer of cling wrap directly on top of the ganache and let it sit until it reaches room temperature. Once at room temperature, refrigerate the ganache until it is firm enough to scoop - 1 to 2 hours. Cover a baking sheet with waxed paper or parchment paper. Use a candy scoop or spoon to form the ganache into 1-inch balls. If necessary, dust your hands with a light layer of cocoa powder and roll the balls between your palms to get them round. 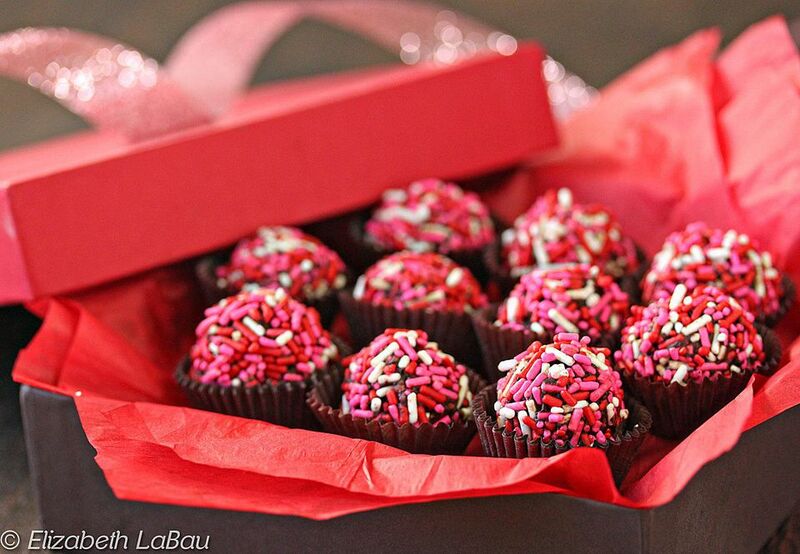 Pour the sprinkles into a bowl and roll a truffle around in the sprinkles. Roll a sprinkle-covered truffle between your palms to embed them into the surface of the chocolate. Once all of the truffles are rolled in sprinkles, they're ready to be served! If you're not eating them right away, store them in an airtight container in the refrigerator for up to two weeks, and bring them to room temperature before serving.